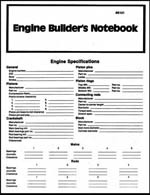 An 8-page booklet you can use to store all information and specs for each engine you build. Lists every engine building step in the correct order. A real frustration saver.